PaperWorkers Local Is accepting applications for INK ONLY II. We are very excited about this edition of INK ONLY making this exhibition our official printmaking biennial. We are also happy to be partnering again with University of Alabama at Birmingham, Department of Art and Art History to bring this exhibition to their PROJECT SPACE. The exhibition is open to all forms of original printmaking including traditional, digital, and experimental processes. Established and emerging artists 18 and over currently living in the United States may enter up to 3 images. Hallie Ringle is the Hugh Kaul Curator of Contemporary Art at the Birmingham Museum of Art. She was formerly Assistant Curator at The Studio Museum in Harlem where she curated Maren Hassinger: Monuments, Firelei Baez: Joy Out of Fire, Fictions, Rico Gatson: Icons 2007–2017, Video Studio: Meeting Points, Palatable: Food and Contemporary Art, Salon Style and Concealed: Selections from the Permanent Collection. She is a fall 2018 Andy Warhol Curatorial Fellow. She has a BA from the University of North Carolina at Chapel Hill and an MA from the University of Texas at Austin. The members of PaperWorkers Local have pooled their resources to establish Birmingham’s first printmaking studio. The cooperative also exhibits the work of local artists and emerging artist from around the country, as well as offering workshops in various media. More information can be found at PaperWorkersLocal.com or visit us at 2717 Seventh Avenue South, Suite 203, Birmingham, Al 35233. 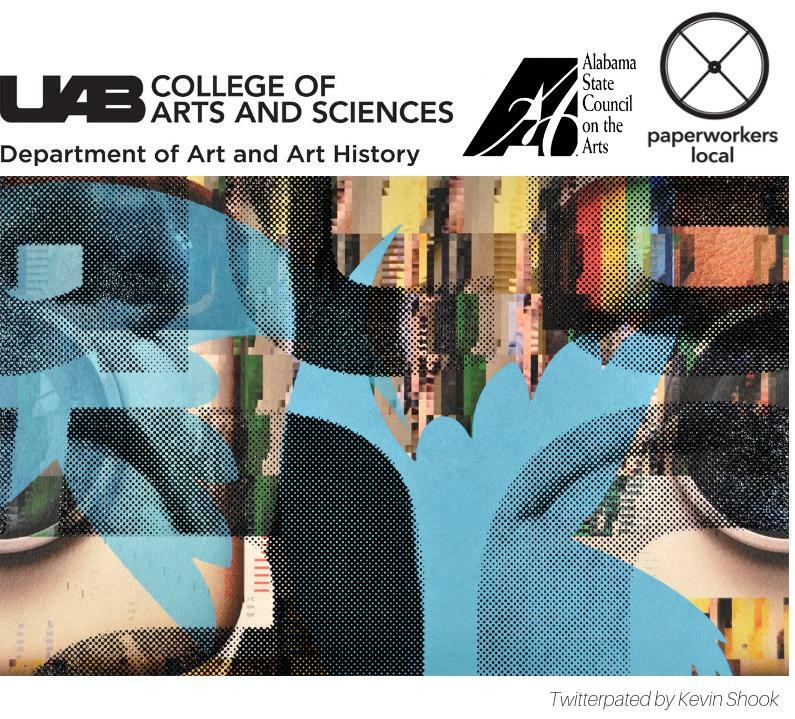 The opening reception and award presentation will be September 7,2019 at 5:00 to 7:00 PM in the UAB Department of Art’s Project Space located at 900 13th Street South in the UAB Humanities Building, Room 100 (on the east side of the building, facing 13th Street South)The Exhibition will run through October 5,2019. All accepted works must be suitably framed with plexi (no glass) and clearly labeled on the back with Name, Title, Date completedAll works must be ready to hang with wire or D-rings (no sawtooth hangers.) All works must remain hanging for the duration of the exhibit.Work that is not properly framed, is not consistent with the accepted image or isn’t delivered before the deadline, will not be included in the exhibit.Accepted work may be hand delivered to PaperWorkers Local or shipped to UAB. Shipping and delivery details will be included in acceptance letters. Shipping and return shipping as well as shipping insurance is the responsibility of the artist.All work shipped must be accompanied with prepaid return shipping label to ensure its return. Works exhibited for INK ONLY II will not be insured. All reasonable care will be taken handling and exhibiting. UAB and PaperWorkers Local accept no responsibility for any loss or damage to artworks.Prices for any work offered for sale or Not For Sale (NFS) must be indicated on the Entry form and on the back of the work. There will be a 20% commission on the sale of any work payable to PWL. Images of any accepted work may be used for promotional purposes or documentation of this and future exhibitions. If you have questions, please send an email to PaperWorkersLocal@gmail.com, attention: John DeMotte. If you use the Google Plus login feature and don't have Google Plus activated, you will need to enter your profile information after you login.